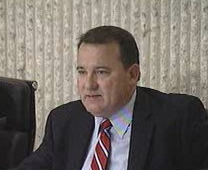 Late Wednesday afternoon I received a press release from the Association of Orange County Deputy Sheriffs announcing rejection of a lawsuit filed by the County of Orange against the Association attempting to overturn the 3% at 50 pension plan. The press release also quantified the legal costs incurred by the County of Orange waging this lawsuit. HOW WILL RIGHEIMER REACT TO THE NEWS? I find myself wondering just how this information will affect Costa Mesa Mayor Pr o Tem Jim Righeimer's assault on our municipal employees wage and pension plans. Will he harden his already granite-like position? Based on recent public comments he seems unwilling to let facts get in the way of his agenda. During a recent council meeting he refused to be impressed with the fact that our fiscal situation is not as bad as anticipated. Instead, he told the staff that he wanted them to come up with $15 million dollars for road repairs in the next budget. Of course, there is only one place to get that money - from staff costs. (AOCDS) their costs for the appeal. again on May 22, before even being set for a formal hearing. such a case. As of July 31, 2010, they have spent almost $2.3 million on their legal costs. with the Board of Supervisors’ litigation effort regarding Orange County Deputy Sheriffs’ pensions. Tonight is the fi nal Parks and Recreation Commission for three of it's members, Chairman Mike Brumbaugh, Vice-Chair Terry Shaw and former Chair Kurt Galitski. Despite each of them requesting to be returned to the commission, the new City Council decided to push them aside and appoint new players. At the meeting tonight beginning at 6:00 p.m. in City Council chambers the commission will address some fairly important issues. They'll begin, however, by bestowing the Chairperson's Award on long-time community activist Arlene Schafer. We only hope they corrected the spelling of her surname on the award because it's misspelled on the agenda report. The commission will then tackle fee increase issues - the Aquatics Program and Instructional Class Fees. None of these will be popular, but they are a direct result of our dismal budget dilemma and are apparently necessary in order to save many of the programs. Following a couple tree removal requests they will address Rest and Renovation Periods for Utility Fields at Costa Mesa High School and Estancia High School; the Athletic Field Use and Allocation Policy and the Recreation on Campus for Kids (ROCKS) After School Program Fee. It seems to me this outgoing majority on the commission will have some pretty tough decisions for their last meeting - some of which might evoke heated comments by residents. We'll see. We here at A Bubbling Cauldron want to join the community in thanking Brumbaugh, Shaw and Galitski for their service to the city. The new members will be sworn-in next week so they can begin receiving materials for the next meeting, which is not until March. According to reports in the Orange County Register and the Daily Pilot, late this afternoon Los Angeles Superior Court Judge Kathryn Solorzano has concluded that there is enough evidence to warrant a criminal trial for Newport Mesa Unified School District Superintendent Dr. Jeffrey Hubbard and his former employee at the Beverly Hills School District, Karen Anne Christiansen. Hubbard is accused of providing a $20,000 stipend for Christiansen and raising her car allowance from $150 per month to $500, both without school board knowledge or approval. He pleaded not guilty on January 3rd to the two felony counts. At it's meeting tonight the Trustees of the NMUSD placed Hubbard on paid administrative leave effective today. According to Britney Barnes in the Daily Pilot this evening, the board voted 6-1 to approve Hubbard's request for leave. Katrina Foley voted no. This case is far from over, but at least the actions taken today will permit the school district to move forward - and permit Hubbard to focus on his case. WHAT ABOUT THE NEWPORT INDY? As an aside, I find it extremely curious that the Newport Beach Independent, a relatively new publication that focuses on all issues involving Newport Beach and published by former Daily Pilot publisher, Tom Johnson, has not printed a single word about this situation - not one! Certainly, this is a newsworthy issue in Newport Beach, right? How do we explain that absence of coverage? I don't expect any news source to cover every single story in it's reporting area, but this one is BIG. But, there is only a void - not even a link to other media outlets. Very curious, indeed. "Where have you been, Potstirrer?" you ask. 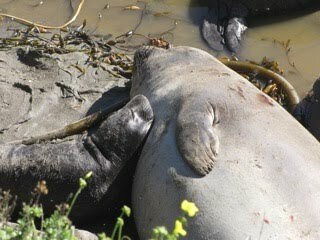 Well, you will recall, on December 26, 2010 (HERE) I gave you a heads-up for a wonderful experience viewing Northern Elephant Seals on our glorious Central California Coast. Last weekend I took my own advice, convinced my lovely and patient wife to join me and visited that rookery, which is in Prime Time again. And, as an added bonus, it's a wonderful way to flush local politics out of your mind for a few days - reason enough to make the trip! 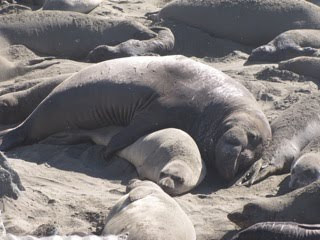 As you can see from the photos included, there are thousands of seals on the beach, including hundreds of pups (at least) born within the past few days. If you take a weekend and make a run up to this site - about 4 miles above Hearst Castle and approximately 280 miles from Costa Mesa - I guarantee you'll have the experience of a lifetime! 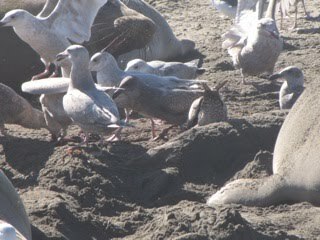 And you'll see the dominant males staying ever-alert for interlopers. All this costs you is a couple tankfuls of gas and a weekend. If you combine it with a trip to Hearst Castle, it will be an even more memorable weekend. 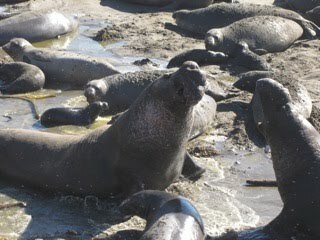 Any time between the middle of December through the first couple weeks of March is great for viewing these magnificent critters, but I always tell folks that Valentine's weekend is a good time because it's so inspirational - there's a whole lot of lovin' going on down on the beach then. PICK A DATE AND DRIVE! 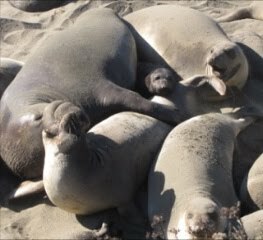 So, target a weekend between now and the end of February because that's when the "action" is at it's best, with birthing, fighting and mating going on simultaneously. 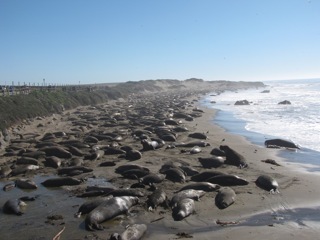 This colony of elephant seals is the fasted growing such group in the world and, by far, the most accessible... you can step out of your car and take 10 steps to view them. 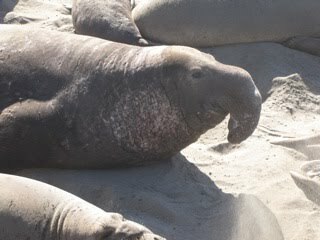 For more in-depth information visit the web site for this location at www.elephantseal.org.